Bruno Mars engaged in a little jailhouse rock when he slapped a pic of himself as a pint-sized Elvis Presley impersonator all over his social media … at least according to the photog who just sued Bruno. 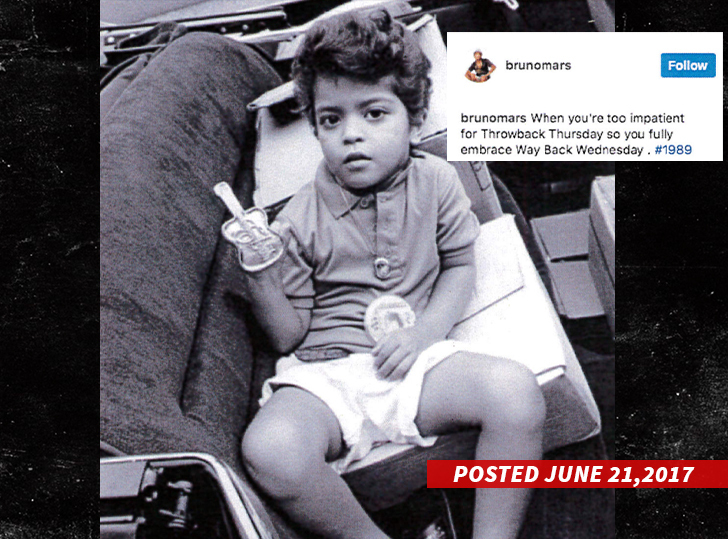 Catherine McGann says she snapped the 1989 shot of Bruno — when he would’ve been just 3 or 4 years old, but was already famously performing the King’s hits. McGann says she owns the copyright on the shot … so, she was shocked to see it pop up all over Bruno’s social media. In the docs, obtained by TMZ, she says he posted it back in June on his IG, FB and Twitter pages … for a “Way Back Wednesday” that blew up. McGann says it garnered more than 1.2 million likes on Instagram alone. In other words … 24k magic! Now, it doesn’t take a suspicious mind to figure out the alleged problem here — McGann says Bruno never got permission to use her copyrighted work. She’s suing Bruno and his record label, Warner Music, for damages and all profits they earned from her photo.